Villa Zen 5 on 5 2 reviews. All rooms are very bright thanks to the great number of windows and French windows. 700 sqm distributed on three floors. Great elegant convivial spaces assure the pleasure of an unforgettable Italian living experience. The central body of the house is constituted by a large living room on two levels, centrally dominated by a great 360° chimney. The dining room is characterized by a table that seats 12 and a pool table. On the same level there is a big kitchen, with a chimney, a grill, 5 burners, an oven, a dishwasher, a large fridge and a table that seats 14. On the ground floor, one side of the living room opens to a superb shady patio, on the opposite side the French windows open to a garden. In the lower part, the living room overlooks a comfortable outdoor area which faces the great lawn and the external infinity pool. On the same floor, going down two steps, the master bedroom with a private bathroom. Next to it a double bedroom and a second bathroom. On the opposite side a spacious kitchen fully equipped. At the center there is a large table capable of seating 14 guests. On the first floor a comfortable living room with a Home-Video system with a Plasma Monitor 50” and Dolby Surround, equipped with DVD player and subscription to Sky TV. A double bedroom with private bathroom, and a terrace overlooking the hills. A third double bedroom and a children’s room with two beds. A bathroom with a shower. At the lower ground floor the relaxing area with internal heated pool and beautiful natural light thanks to 5 big skylights. On the same floor an accommodation for staff equipped with kitchenette, living area, sofa-bed, double bedroom, bathroom with shower, can sleep up to three people. The beautiful house, recently refurbished with great care, is characterized by architectural elements that are based on the local tradition, such as the embrasures inspired by the ancient barns or the arches that surround the windows, the wooden beam ceilings, the white-washed oak flooring. It features a wonderful internal heated pool, an external infinity pool and a glorious garden. The location is perfect for your Italian stay: less than 10 minutes by car from one of the most beautiful Tuscan beach. Cinzia, We had a wonderful stay in Villa Zen at the beginning of July. The villa itself, the grounds and the surrounding area lived up to, and often surpassed, all that was promised on the website. The warm welcome and service provided by both YourTuscany staff and Rita, the housekeeper, contributed greatly to our enjoyment of our holiday at this superbly equipped and well laid out villa. 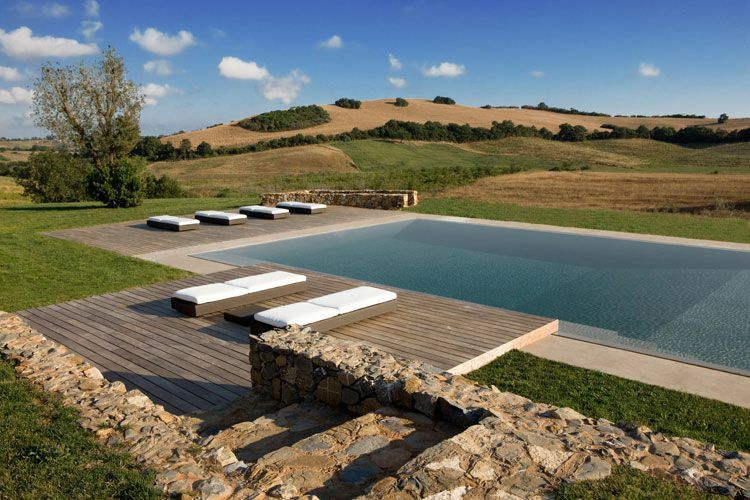 I would recommend this villa to anybody looking for a relaxing, away-from-it-all break in a beautiful and unspoilt part of Tuscany. Hi Cinzia, Everything was good and the house is very good. Rita and Alessandra were great. Thanks for everything. Thanks, again. Ciao!